Is this apparatus for a 19th century James Bond or a view camera on steroids? Take a close look. Lurking under all the gizmos is a Rochester Optical Company Universal field camera. 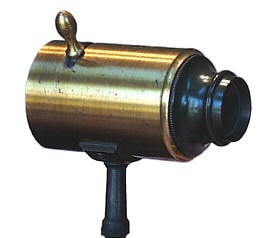 The Universal was one of many Rochester Optical Company cameras that were made in the English compact folding style. Offered from 1892 - 1904, it is constructed of finely polished Honduras mahogany in formats ranging from 3-1/4 x 4-1/4 to 11 x 14 inches. In 1895, formats up to 17 x 20 were advertised. 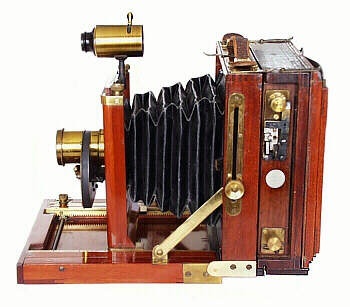 This particular Universal is a 4 x 5 inch, single-swing model advertised for $28 in 1892, or about $531 in year 2000 dollars. The Universal is not a rare camera, but this example is intriguing with its unusual accessories -- the most noticeable being the rare W.H. 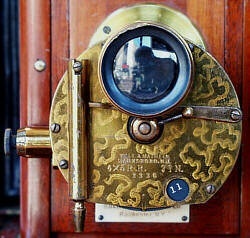 Walmsley brass viewfinder. Perched atop the lens board (below far left), this straight-line viewfinder is eerily reminiscent of a sniper's spotting-scope. The brass lever rotates a miniature ground glass inside the viewfinder for landscape and portrait orientations. The purpose of this small device is to aid in taking instantaneous pictures of moving objects by observing the scene on the miniature ground glass. The last noteworthy item is the Thornton Pickard rollerblind shutter (above middle). How much more interesting can an American camera get than having an English focal plane shutter mounted on it? Thornton Pickard, known for their finely crafted cameras is also famous for rollerblind shutters. Most were mounted either behind or in front of a lens. 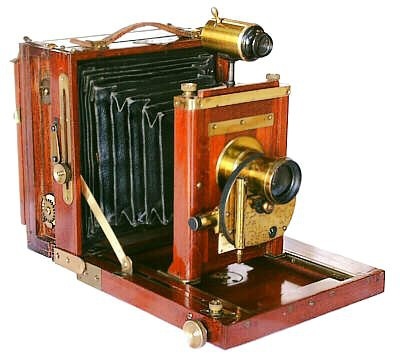 Thornton Pickard also built the Focal Plane Imperial Two-Shutter Camera, a view camera with a rollerblind shutter built into the rear standard. As can be seen in the image above. the Thornton Pickard FP shutter accessory fits between the body and ground glass frame. Update 09-2001: Thornton Pickard furnished focal-plane shutters as catalogued, accessory items much as they did their better-known rollerblind units. This particular shutter is an early 1890s model with a non-adjustable slit design; a pair of chains connects the upper and lower blinds. Shutter speeds are 1/100 to 1/1000 of a second. Later models offered an adjustable slit design controlled by an external knob. A Wale pneumatic release shutter graces the front of the camera (below far right). It is marked "Wale & Mathein, Marksboro, N.J." and incorporates a less exotic (simple) rapid rectilinear lens. The knob protruding from the left of the lens controls the shutter speed. Wale shutters are rare items and examples built for 4 x 5 inch and smaller formats are very hard to find. As a note, recent research indicates that the shutter was actually made by Mathein while George Wale produced lenses.